Cosmopor® E is a self-adhesive sterile island wound dressing which is ideal for the postoperative wound treatment, but it can also be used for the sterile treatment of minor injuries such as in first aid and patients with sensitive skin. It has a sterile viscose absorbent pad (island) in the middle to cover the wound. A hypoallergic colophony free synthetic rubber based adhesive at the border helps to fix the dressing in place and can be taken off easily without disturbing the wound bed. Cosmopor® E is a perforated film absorbent dressing which allows the wound to breathe normally. 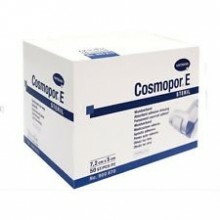 Cosmopor® E dressings are suitable for the wound with mild to moderate amount of exudate. Unlike other synthetic adhesives, hypoallergic colophony free synthetic rubber based adhesive prevents irritation of surrounding skin and enables the natural functions of the skin to continue.